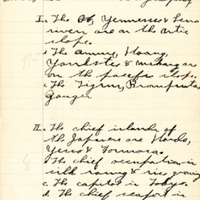 A geography assignment completed by Sanford High School eighth grader Verne Messenger in 1909. In 1948, Messenger married Lourine Vickery, who became the first woman to hold public office in Seminole County when she was appointed as Supervisor of Registration by Governor Fuller Warren. Original school assignment completed by Verne Messenger, May 11, 1909: Sanford High School Collection, box 3A, folder Student Work 1909, item SCPS00513, UCF Public History Center, Sanford, Florida. Digital reproduction of original school assignment completed by Verne Messenger, May 11, 1905. Originally created by Verne Messenger. Stinecipher, Grace Marie. "The Way We Were." The Sanford Herald, October 29, 2006. http://mysanfordherald.com/bookmark/225644-The-Way-We-Were. Messenger, Verne. “Sanford High Geography Assignment, 1909.” RICHES of Central Florida accessed April 21, 2019, https://richesmi.cah.ucf.edu/omeka/items/show/3894.